Charon discovery images: In mid-1978 U.S. Naval Observatory astronomer James W. Christy noticed something unusual – a bump to the side of Pluto which turned out to be Charon. 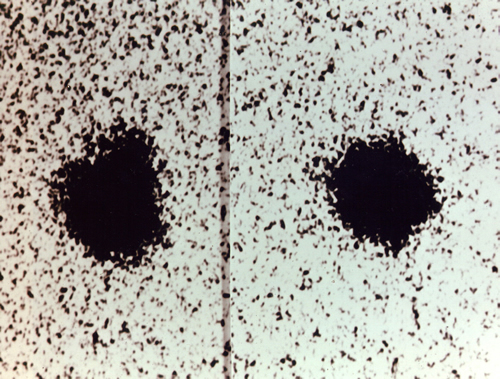 These discovery images were taken while he was making routine measurements of photographic plates of Pluto taken in June 1978 with the 1.55-meter (61-inch) Kaj Strand Astrometric Reflector at the Observatory’s Flagstaff Station in Arizona. Learn more. This week the New Horizons mission team is celebrating the 35th anniversary of the discovery of Pluto’s largest and “first” moon, Charon. This discovery was made in 1978 by U.S. Naval Observatory astronomers James Christy and Robert Harrington, working in Flagstaff, Ariz., and Washington, D.C.
Charon, whose discovery was first announced on July 7, 1978, orbits about 19,400 kilometers (12,500 miles) from Pluto and has a diameter of about 1,207 kilometers (750 miles) — about the width of Texas. At half the diameter of Pluto, Charon is the largest moon relative to its planet in our solar system. Charon’s reflective but almost colorless surface is covered by water ice, and may contain traces of ammonia or ammonium as well. Its interior is much less rocky than Pluto (which is nearly 70-percent rock). By contrast, Charon’s interior exhibits a nearly 50-50 combination of rock and water ice. And unlike Pluto, Charon has no substantial atmosphere. The historic discovery of Charon ushered in the modern understanding of Pluto as both a double planet and the product of a giant collision that formed the system in much the same way as the Earth-Moon system was formed. 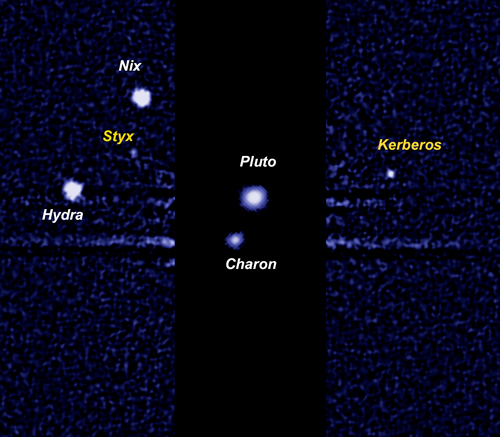 We now know that Charon, once thought to be Pluto’s only moon, orbits Pluto with at least four much smaller moons: Nix, Hydra, Kerberos and Styx, all of which, like Charon, orbit in circular paths and in Pluto’s equatorial plane. From Charon, Pluto looms large in the sky—more than 14 times as wide and 200 times as big of an area as the Earth’s moon appears in our sky. And at “full Pluto,” Charon’s night side is about 50-percent brighter than a full moon in Earth’s nighttime sky. New Horizons is on course to fly by and make the first reconnaissance of the Pluto system just two years from now, in July 2015. When it does, the spacecraft will turn these moons and their parent planet Pluto from points of light into well-mapped worlds, chart their compositions in exquisite detail, explore Pluto’s atmosphere, search for other moons and rings, and make many other observations as well. We’re pretty excited to see Charon explored and its appearance revealed in just two years, and hope you are too. That’s it for now. Until I write again, I hope you’ll keep on exploring – just as we will! First, but certainly not alone: Once thought to be Pluto’s only satellite, Charon is one of at least five moons in the Pluto system.